Sponsored by the Global Village Museum of Arts and Cultures which is dedicated to showcasing international folk art. Textile artisan cooperatives and social enterprises exist all over the world, each one with a similar mission of preserving cultural traditions and history, a need to establish a sustainable economic base for the artisans and their families, and a desire to enter into the larger global commerce market. 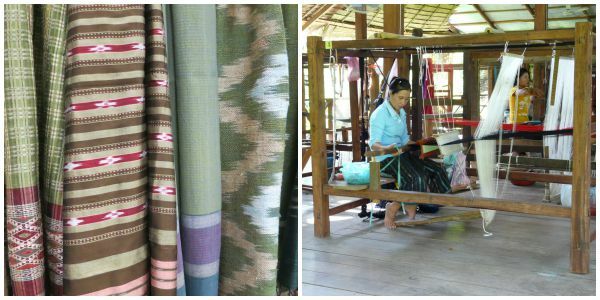 Come behind the scenes through the textiles and stories of artisans from Indonesia, Laos, Myanmar, and the Philippines to see how they are preparing for the future. Many textiles will be shown with an opportunity for purchase. 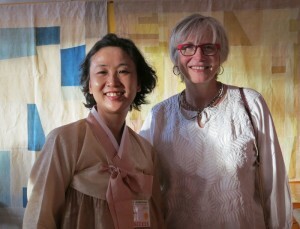 Korean artist Kim Sunghee with Marilyn Murphy standing in front of traditional naturally dyed patchwork cloth (pojagi). Marilyn Murphy is Managing Partner of ClothRoads: A Global Textile Marketplace and co-president of The Andean Textile Association.